The Hump is the name I've given to the humpy old sand hill between the house gardens and the front paddock. It has an old row of pine trees at the back, plus the odd large gum tree - this was the common idea of wind shelter when the property was first planted, back in the 1980s. 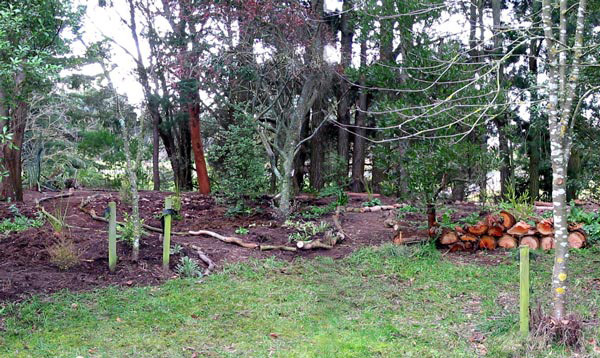 The trees and the sand have made it THE most difficult area in which to establish a garden. So guess who just had to try? I've gardened the Hump slowly and surely, over many years. I've been really patient for once - check out these before and after photographs! I'm very proud of myself. The planting scheme - dare I call it the 'garden design' - suggested itself. Quite early on I noticed native Pittosporums self-seeding underneath the tall branches of the shelter trees. So I encouraged this, creating a Pittosporum forest. I added phormiums, hebes and ornamental grasses. Slowly over the years the Hump changed from a messy and inhospitable place into a forest-like garden densely planted with foliage plants and cross-crossed with dirt paths. 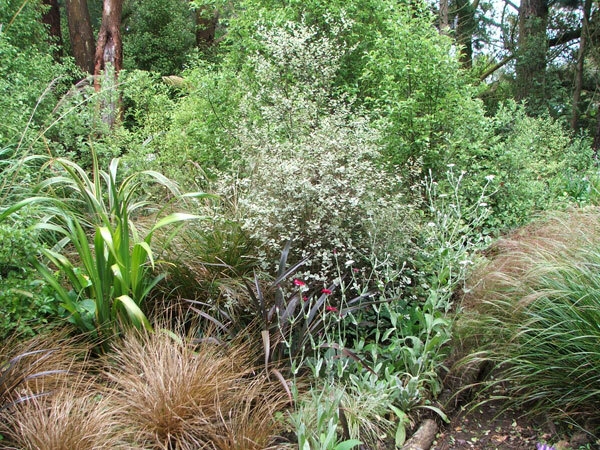 For my latest project in the Hump I've planted a Cordyline Glade with an encircling path, reaching the old fence line by the driveway. Here are the old original shrubs - Senecios and Pampas grasses, underneath which Rusty the dog discovered a wasps' nest just last year. Ouch! The land beyond the pine trees is a designated dumping place for my garden rubbish - a gardener has to stop somewhere! Loads of compost, horse manure, and mulch have been added to the Hump Garden's soil. I've now cleared about two thirds of the area - so things aren't quite finished. Each spring the interior of the Hump puts on a huge show with purple and white flowering Honesty - self-sown, of course. 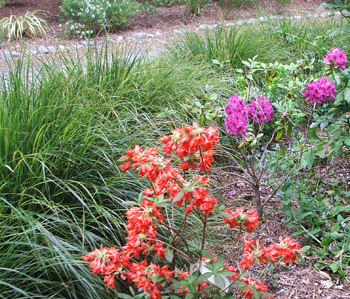 The soil seems deceptively moist in this season, and it's easy to make huge planting mistakes (one year I did just this, and proudly installed several rhododendrons - oops). At the very end of the Hump the driveway curves out to the road. 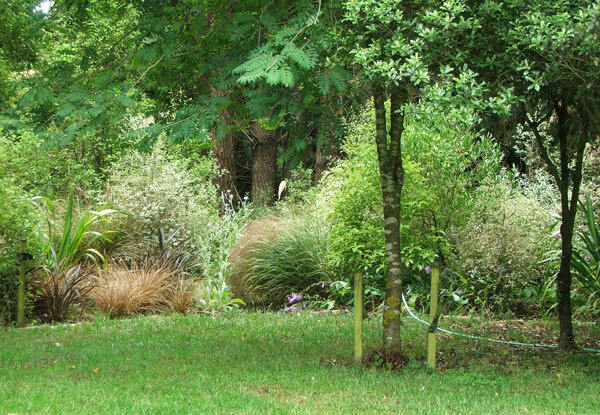 I've followed the curve with grasses, cleared out a Cotoneaster, and planted a lovely group of deciduous Azaleas, along with several reject rhododendrons - the irrigation does reach them here. A path leads right past them into the leafy depths, edged with Pittosporums and Hebes. 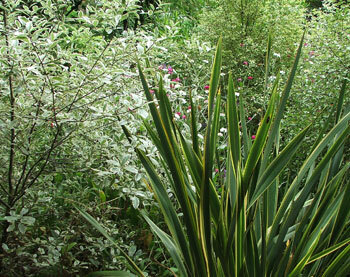 Many small Cordylines have started themselves from seed - eventually they'll grow through the understory. The Hump is now a secret forest-like place, crammed full of shrubs and small trees. 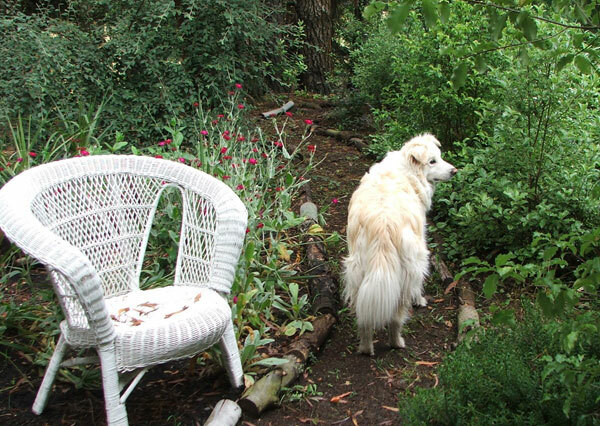 So my latest garden seat, a comfortable white cane armchair, fits the picture perfectly. A special thank you must go to Non-Gardening Partner, who has spent ages over the years chain-sawing fallen branches and removing this and that scruffy tree which I didn't want. Without his input I couldn't have cleared and planted the Hump garden. Yippee for NGP!